Ed Cheverton’s ability to combine parable with cosmic level concepts makes for a memorable short comic experience in the pages of World Builder. 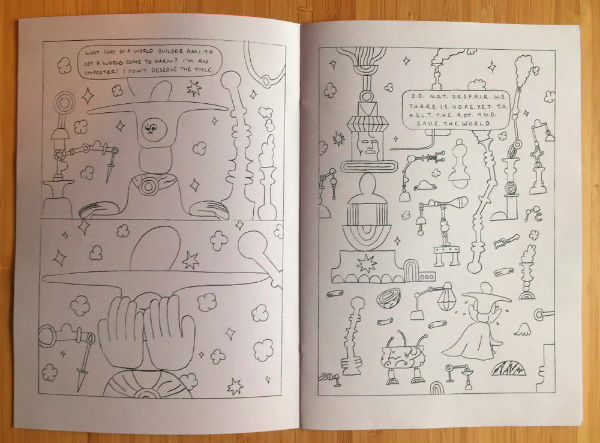 The force behind Jazz Dad Books has been concentrating on his own projects of late and it’s seen a prolific flurry of minicomics (and even the odd anthology contribution). As a result he had a notable selection of new work on show at the East London Comics and Arts Festival earlier this summer including today’s review subject. On a surface level World Builder immediately catches the reader’s attention with its captivatingly bizarre and strikingly coloured cover. The World Builder of the title is a being of unimaginable responsibilities who creates planets in his celestial workshop, carefully curating his amazing display of worlds. But something has gone terribly wrong in his gallery of realities. One of them is displaying a corruption at its core. With the aid of the Central Intelligence can the World Builder stop this rot at its source and save the integrity of his collection? Cheverton’s pages in World Builder employ a deliberate visual naivety; a constructed deceptive simplicity that adds nuance to the majestic environment of the World Builder with the scattered shapes, busy panels and disproportionate randomness evoking a sense of invention and creation in constant rhythm and flow. Indeed, in amongst the apparent self-aware silliness there’s a feeling that there’s something very meta going on here. Whether the events of the World Builder are, indeed, a wider allegory for the creative process and the artistic ego is ultimately for Cheverton to know and for the reader to wonder. The World Builder’s reflections on his practice and output could certainly be interpreted that way with his gallery of worlds taking on the role of an allegorical artistic portfolio. Alternatively, of course, it can be viewed more simply as an offbeat fantasy caper; an alt comics version of the most cosmic kind of Kirby concept. What isn’t in doubt, however, is that World Builder is a perfect entry point for any reader looking to investigate Cheverton’s work further. Whether you enjoy his narratives at face value or look for something more profound within their panels his distinctive visual style and sprawling imagination ensures his comics are always a mind-bending treat. For more on the work of Ed Cheverton visit his site here and follow him on Twitter here. 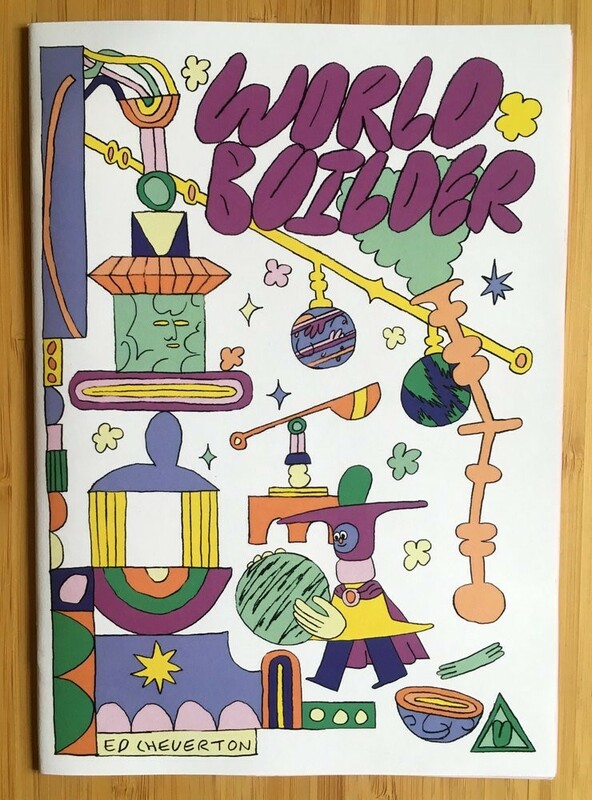 You can buy World Builder from his online store here priced £4.00.